I am a big-time game person, and our family loves having family game nights! I love learning about new games, and when I find them, I love letting others know about them. 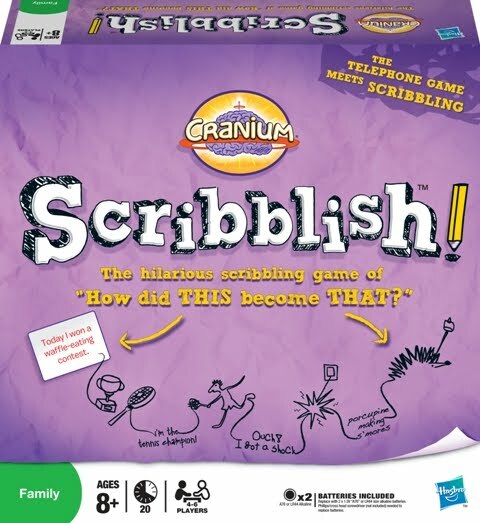 We are coming into the winter months, and it seems like families play more games during the winter months, I was recently introduced to a new game from the makers of Cranium called, Scribblish, and it is a really fun game! Did you play telephone when you were younger? You know, the game where you sit in a line, the first person (the operator) tells a person a secret, and that person has to relay (call) the next person in line. The secret travels down the line until it reaches the last person, and that person relays the message from the beginning. Hopefully, the message was clearly stated, and nothing got mixed up in the line of communication. 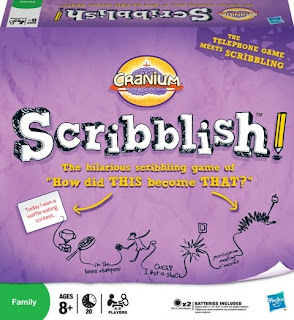 Scribblish, the new board game, is a lot like telephone, except you write your message on a paper....like pictionary. Each person playing has a scroll, a piece of paper, a pen, and a certain level of drawing abilities. Each person slides the piece of paper into the scroll with the first line visible. Drawing a card, players choose which statement they want to do. Then, they write the statement, start the timer, and draw a picture to go with that statement. When the timer goes off, each player must slide the paper up enough so others will not see their drawing. One person rolls the dice, and depending on what is revealed, players will move their scroll to the person on the right, left or put in the middle for a shuffle. Each player gets a new scroll. With a new scroll, players get to see just the picture drawn, then they get to write what they think the picture is saying. Another dice roll happens, and the new person with a different scroll writes a statement to go with the new picture. This happens over and over until the whole paper is full. At the end of the game, each person gets to choose which scroll they think is their original scroll, based on the last picture drawn, and puts a "MINE" token on it. Then, each player puts a "FUNNY" token on the caption, or drawing they think is the funniest. Players get tokens based on if they are right, or other players pick their drawing. This is a great game for a fun family gathering, like for the Holidays, Birthdays, family game night, ladies night out, or other fun nights for games. I highly recommend this game! It is a great game for good laughs, creativity and imagination! This contest is open to bloggers, and non-bloggers of the United States, and will end on December 4th. To enter, comment about which Cranium game you love to play with their family and friends! This review was provided from Hasbro (with a game to review), information, and prize packs is given through MyBlogSpark. I am sponsored to offer a giveaway for my readers through this review. I was given the product for my personal opinion and option to share with my readers. I was not compensated for my time or written review. We have had our Lampquarium going in the dining room, and so many people have commented on them. The big question we get, "Are they real?" Really, they do look real, and once you watch them for awhile, you will know they aren't...only because of the bubble motor. At first glance, they look really real! My kids love watching the jelly fish dance around in the water. We sit and watch them for quite awhile. The colors are beautiful, and the jelly fish go all over in the water. 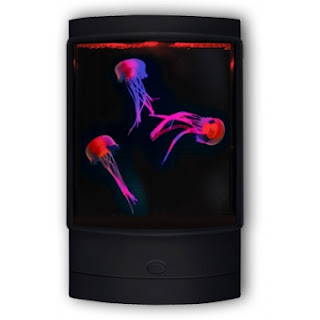 When we got the Lampquarium from Wild Creations, we got the aquarium, directions, three plastic jelly fish, and the AC adapter. The assembly of the Lampquarium was easy to understand, and easy to set up. Adding just a few drops of liquid soap and water, within minutes our jelly fish were moving in action. My oldest son keeps the Lampquarium in his room, and he said that it is so relaxing to have it running. He loves the colorful display, and watching the jelly fish. We are very impressed with the Lampquarium, and highly recommend it. Wild Creations has amazing products! I was first introduced to them with a review of their Dwarf Frogs in the EcoAquarium! That was such an amazing product to review, because the frogs shipped LIVE~ I am still amazed at that! My kids love the frogs, too! Such an easy pet to care for, feed and clean. With being so amazed with the EcoAquarium, I was very excited to review one of their new products. With choosing the Lampquarium, I give the company a big cheer, and happily promote them! I think that Wild Creation products are creative, fun, educational, and are priced just right for the value! You can purchase the Lampquarium online from Wild Creations for $39.99. Wild Creations introduced more than 40 new products in 2010. The products share the same playful spirit as the EcoAquarium, and come from British licensed lines Wallace & Gromit, Mensa, Natural History Museum and more. Kids and adults will enjoy creating a human-sized bubble with the Mega Bubble, or testing the steadiness of their hand with the Buzz Wire Bomb, and even planning sneak snake attacks with the realistic RC Rattlesnake! With the promotion of the new products, I am able to host a giveaway for one of the following: RC Rattlesnake, Buzz Wire Bomb, Water Rocket, Mega Bubble, Hologram Chamber or the Lampquarium (what I reviewed). Enter to win one of the products listed above. This contest is open to bloggers and non-bloggers of the U.S.
FOR YOUR ENTRY: please visit WildCreations.com and find out a product that's being introduced in Fall 2010. For extra entries, become a fan of Wild Creations on Facebook or subscribe to the Frog Blog or the company's YouTube feed. This contest will end on December 1, 2010. I was contacted by Wild Creations to do a product review of their Lampquarium. They sent me free product in return for a review and promotion. I was also able to host a giveaway for my readers, sponsored from Wild Creation. I was not compensated for my time or written review. Disney's Magical Journey~ Disney On Ice : GIVEAWAY 4 tickets for MN Show in December 2010! The only Disney on Ice with Peter Pan...a perfect Disney on Ice for boys and girls...because you get such a variety with the Disney On Ice : Mickey & Minnie's Magical Journey! I am so excited to attend this show with my family, because my daughter's favorite is Ariel and Lion King, and my boys love the action with Peter Pan, the lost boys and pirates! I love the different themes in this particular production, because it is geared for both boys and girls, and the Disney on Ice shows are spectacular!! Make imagination your destination! Join Mickey Mouse and Minnie Mouse on a journey into the magical worlds of Disney's The Little Mermaid, The Lion King, Peter Pan and Lilo & Stitch. Discover Ariel and Sebastian's enchanting undersea kingdom; visit the Pride Lands with Simba and Nala; soar through starry skies with Peter Pan and his sassy friend Tinker Bell; and say "aloha" to fun with Lilo and Stitch. You'll be captivated by the music, beauty and laughter in a journey so magical, you'll never want to go home. Mickey & Minnie's Magical Journey is a show that is perfect timing for the holidays! Great family gift, and outing to a show, that is valued at a great, and affordable price! Thinking of a Stay-cation this year for affordability? Check out the prices on this show!! I am hosting a giveaway for a family 4-pack of tickets to this amazing show! Not hard to enter...just note, that this show is for the MN show, for the weekend of December 9-12. I will let you know which day you will go, and the time. You can sign someone else up, too. To enter, Just leave a comment with your favorite Disney Character! You can comment everyday, until December 3rd, 2010. You can also sign up on my facebook Sassyfrazz page!! Plus, you can follow me on twitter, and/or subscribe to my blog for extra entries, comment on other blog posts, enter other giveaways ....just leave comments about what you did. :) Thanks so much, and good luck!! Make your own baby food with Annabel Karmel products! I have always wanted to be more frugal with my options, especially when it comes to baby food. Buying pre-made baby food items can get so expensive, and sometimes, there is added ingredients that you may not want your baby or toddler to have. I love the new food product line that Infantino carries: the Annabel Karmel products! I really like the Mash & Serve bowl, because it is a great product to mash that fresh fruit, like strawberries, blueberries, bananas and more! This bowl works great for babies 6 months and older. I like how convenient this product is, because I can mash up the fruits/vegetables, and then serve it to my baby right in the bowl. The bowl has a little handle for easy use. I love that the Annabel Karmel products are BPA free, which gives me reassurance that my baby is fed safely. The Fill & Freeze Puree Pops are so much fun! With these freezer pops, kids will get the fruits they need, in a fun way! Each of these Freeze Pops can be divided and separated, or you can snap them all together to freeze all four at once. Each pop has a different color handle. The Fill & Freeze Puree Pops has a great recipe on the box for Annabel's tropical mango fruit pops. It sounds delicious! The Stackable Food pots are 6 individual portion-sized containers that you can put the perfect amount of food in for your baby/toddler. There are two- 1.7 oz. sizes, two- 2.5 oz sizes, and two- 3.4 oz size pots. I really like that these containers are designed to go into the freezer. This makes it great to make a bigger portion of a food item, and then freeze portions for future use. I am so excited to make my own baby food with this baby, and these Stackable food pots will be so handy when I am preparing the baby's food. I like that the food pots have lids, so I will be able to bring my baby's food with me on the go. I love the Annabel Karmel Freeze trays, too, because I will be able to puree foods like fruits and vegetables, freeze them, and they are ready for when I need them. I also like this product, because I can freeze foods, and bring them with on a trip. When the foods thaw out, they are ready to eat. It is known that frozen food can last longer, too, and I am thankful that with the use of the Annabel Karmel Freeze Trays, I can store my baby's food longer. The Fresh Food Mill is a great tool for every mom! I love how you can put most any food into the food mill, grind it up, and feed your baby! Some of the skins on vegetables like peas and potatoes gets ground up easily with the Food Mill. On the side of the box you will find a recipe for Annabel's lovely lentils. I think the Food Mill does the best job at making food a puree. I really like that the Annabel Karmel products work so great together, because you can use the Fresh Food Mill to puree your baby's food, then store the food in the Stackable Food pots and/or the Freeze Tray! I also love that the Annabel Karmel line is dishwasher safe, too! That is a big plus for me! As your baby gets older, the Annabel Karmel Steam Release Micro Dish is great for bringing fresh vegetables for steaming. The Steam Release Micro Dish is BPA free, and microwavable. I love that I can steam fresh vegetables for my baby and serve them right in the same safe dish. The Micro Dish stores a perfect serving, too! Annabel Karmel products are a great set of products to make all your own baby foods, and store them safely. I am so excited to have this line of products for our next baby on the way, and I wish that I would have had these products with my other babies. I highly recommend these products to you, and also recommend these for those baby registry lists! The Annabel Karmel products help a parent in the kitchen, making food quicker and healthier for their babies (in my opinion). I think that with the help of the Food Mill and the Mash and Serve bowl, little ones can eat foods that will be easier for them to eat. Annabel Karmel is a mother of three, and is the UK's best-selling author of seventeen books on baby and children's food and nutrition. She is an expert in devising tasty and nutritious meals for children without the need for parents to spend hours in the kitchen. I love that Infantino carries this line, and I think that many parents will appreciate the time saved by using the Annabel Karmel products. Infantino carries great products! To check out the Annabel Karmel feeding line that Infantino carries, just check out their website at INFANTINO.COM. We had a House Partypalooza Fuzzoodle Party, and my kids were so excited to check out these new fun toys! The party was a success, and all the kids had a great time creating, bending, twisting, and designing their creatures! A Pretty Pink creature....there were so many accessories to pick and choose from for each kid to make their creature exactly how they wanted. The moms had a great time helping their kids make the creatures. We had a few instruction booklets to help us learn how to figure out how to manipulate the pieces to make creatures. We really like how the pieces were so colorful, and that the Fuzzoodles are designed for both girls and boys. There is a great selection of eye, nose, mouth, hands, feet and other accessories to choose from. Creating a Fuzzoodle can be a bit challenging, but with some movements you can make your creature just the way you want. Long legs, short legs, arms or no arms....the creation can be very unique. So many decisions, many options to choose from. Fuzzoodles are just as much fun for kids and sparking their creativity, as well as for kids. Each child was able to make 2-3 creatures to bring home. We each got a fun Fuzzoodle bag, too. Trinity got a bumble bee Fuzzoodle. I think Madelyn's girl-type Fuzzoodle looks like the bird from Chuck E. Cheese. What's a house party without food? I served home made guacamole, chips, fruit cups, colorful sherbet and green juice. The kids (and moms) all had a great time. The Fuzzoodles are a hit, and I recommend them for gifts for your kids. The Fuzzoodles spark creativity and fun for kids, and it is a great project that kids can do over and over. I like that the Fuzzoodles are re-usable, so kids can create, re-create, and make another new. Great fun, and it was a successful party! Thanks to all the moms that came with their kids to check out the the new Fuzzoodles! This review was provided from House Partypalooza. They have provided me with Fuzzoodle kits to host for a house party, and to give away to my guests. I was also given a $10 Toys R Us gift card to give away to one of my guests. I was given the product to host a house party and to share my personal opinion and option to share with my readers. I was not compensated for my time or written review. ~~Fun Family Fall Pictures~~pumpkin picking & carving, halloween, and birthdays. We went to Disney Live! Mickey's Magic Show, as a family, and it was a blast! None of us have ever gone to one of those shows, but it was highly entertaining and captivating to see! I think the magic tricks are fun, and I would love to know how they did the tricks! We went to a pumpkin patch to get pumpkins, per Caleb's request. He wanted to go to the patch and pick out the best pumpkin. We only drove about 30 minutes away, and we could pick which ever one we wanted, and take our time. I love MN Grown Vegetables! It was a big pumpkin patch, and the kids loved walking around looking for their treasure. I liked that their were wagons available to tote the pumpkins back to the van! It was quite an experience, and the kids had a great time. Nathaniel didn't come with us, but we still had fun. Nathaniel was with a friend for the day. Caleb loved riding in the wagon, too. Time to go home. It was chilly outside, but that didn't stop the kids from getting their pumpkins. They had so much fun! Then, we went home and had hot chocolate and marshmallows. A few days later, we had a night of carving pumpkins. It was a fun experience, and the kids had a blast! They all loved digging out the guts of the pumpkin, separating the seeds, and cleaning out the pumpkins. Cole loved eating the raw pumpkin guts and the seeds. He didn't seem to mind the flavors, and we didn't think it could hurt him any. Madelyn wanted a kitty on her pumpkin, so I drew what I thought a cat would look like, and did my best. Caleb wanted a bat, so I drew a bat and carved that out for him. I had a winking pumpkin with hair around the sides, and Terry had the traditional pumpkin with fang-looking teeth. I think his was the scariest. However, Nathaniel made his pretty interesting..and he was very creative! Cole's pumpkin was a silly face. We separated all the seeds, cleaned them up, and baked them. They were delicious! Terry's special recipe. Then it was time for trick or treating. The kids got to dress up in their costumes for church that morning. They each wore the same costume all day, except Caleb. Caleb was Spiderman in the morning, and a Power Ranger for evening. Madelyn was a bumblebee (which she was last year...but I might as well use it two years, right?) and Cole was Jo-Jo the Clown. It was fun to see kids handing out candy at a few of the homes. The kids had a great time, but it really got cold outside. Lena, our pugachin, was even dressed up. Nathaniel dressed her up in Maddy's Tinkerbell skirt, and some angel wings. It was a fun day. We like doing Halloween because my kids love to dress up, and they love to get candy. That evening we celebrated Nathaniel's birthday, our friend's son's birthday, and the grandparents were over. It was a busy night!